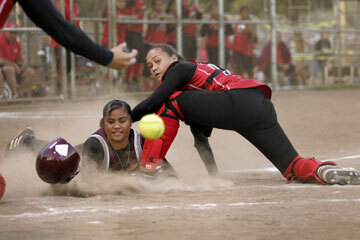 Farrington runner Chantelle Scanlan-Sevao scores from third base when Kahuku catcher Brittney Fesolai lost the ball. Saleia Mataafa and Shawntei Cabe combined to give up just two runs over seven innings as Kahuku (10-2) defeated Farrington (8-4) 4-2 yesterday for the third time this season to win the OIA White Championship at Central Oahu Regional Park. Camica Wooten drove in both Farrington runs on a double. Felecia Tui pitched a complete game for the Governors but was tagged with the loss. Keisha Moeai was the only Red Raider to have two hits. Saleia Mataafa, Shawntei Cabe (4) and Brittney Fesolai. Felecia Tui and Kinci Ngiralmau. W--Mataafa. L--Tui. Leading hitters--Kah: Keisha Moeai 2-3; Far: Monique To 2-3; Camica Wooten 2-3, 2b, 2 RBI. Brittany Tokunaga homered and drove in three runs and Netia Ulugaono added three hits as the Surfriders defeated Na Menehune in the third-place game. Ashley Hopfe pitched all seven innings to record the victory. Dawn Dela Cruz had three hits to lead Moanalua. Ashley Hopfe and Brittany Tokunaga. Sarah Robinson and Kawehi Chan. W--Hopfe. L--Robinson. Leading hitters--Moan: Britni Ronolo 2-3; Dawn Dela Cruz 3-4, 2b. Kail: Hopfe 2-4; Tokunaga 2-4, HR, 3 RBIs; Netia Ulugaono 3-4, 2b; Tiffany Uperesa 2-4, 2b; Januari Santiago 2b. Deja Manubag had four hits and Brittney Brackenridge drove in four runs as the Hurricanes defeated the Marauders in the fifth-place game. Kishti Kamaka pitched three innings to get the win and Kaili Smith had three doubles for Kapolei. Waipahu's Cina Luu had two hits and two RBIs in the loss. Both teams still qualified for the state tournament. Kishti Kamaka, Ciara Acierto (4) and Ashlynn Ashby. Dana Aiwohi, Lei-Sha Quiday-Kapihe (2) and Quiday-Kapihe, Andrea Mendiola (2). W--Kamaka. L--Aiwohi. S--Acierto. Leading hitters--Waip: Cina Luu 2-4, 2 RBIs; Andrea Feliz-Laa 2-3. Kapo: Amber Kamaka 3-3, RBI; Deja Manubag 4-5, 3b, RBI; Kaili Smith 3-5, 3 2b's, RBI; Brittney Brackenridge 2-3, 2b, 4 RBIs.